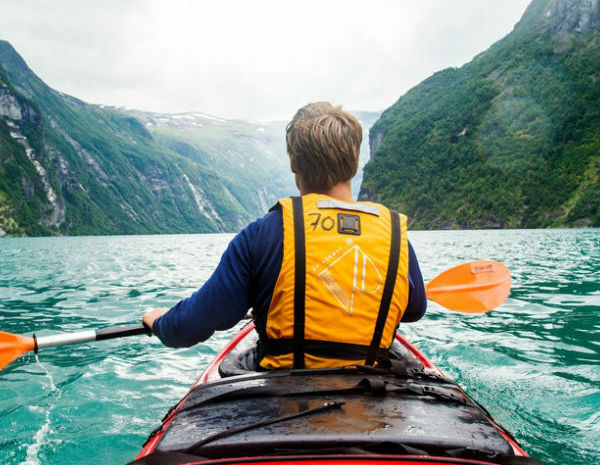 Geirangerfjord is a great, safe place to paddle. It is rarely windy here, as the fjord is usually completely mirrored. Get close to the waterfalls and the nature in the fjord. It is also advisable to combine the trip with a visit to one of the many fjord farms such as Skageflå, Knivsflå and Blomberg. We provide you with instrucutions and all the gear you need (spray skirt, paddle, phone cover, maps and dry bag). Our staff is highly qualified and can provide you with information to improve your technique. If it is raining you are dry in a kayak if you wear a waterproof jacket. We also have kayak jackets for rent. With children it is advisable to go in a double kayak. Welcome to us and please enjoy!